Had time for twenty minutes gulling at Barton Cove this afternoon. 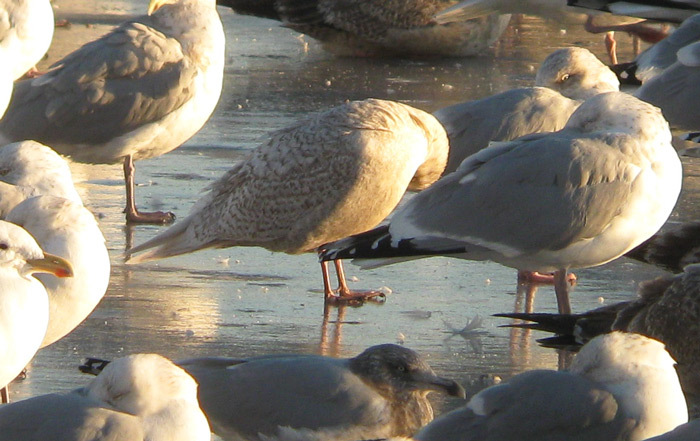 I arrived at 15:30hrs with about 300 gulls scattered about the ice and on the water. 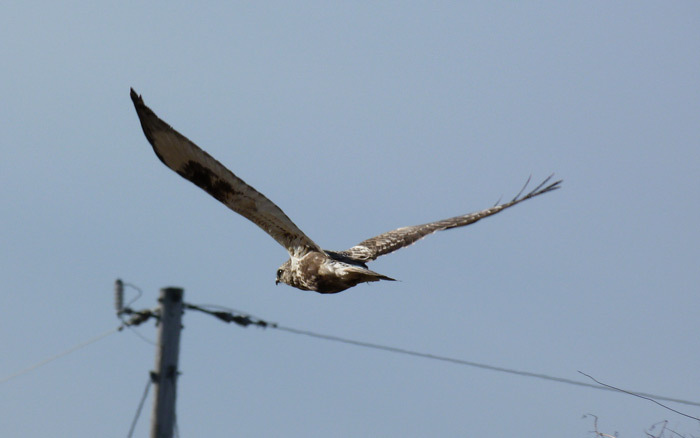 As with the last few days, strong winds seemed to make the birds especially skittish and they never really settled. 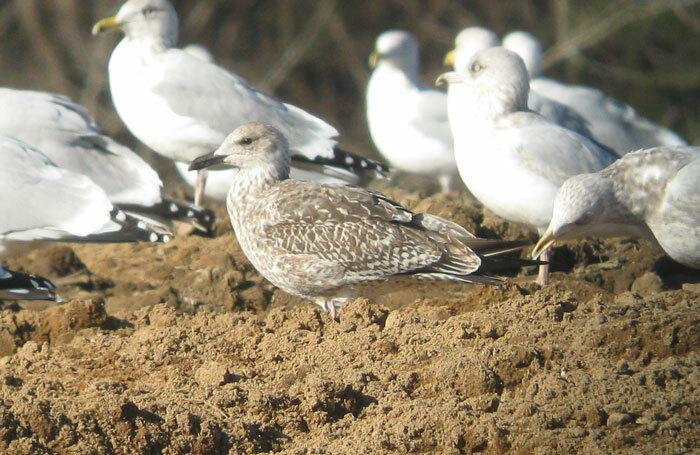 Even so, I was delighted to find a 'new' Kumlien's Gull, a second-cycle bird, notably small, tiny in fact with notably brown primaries and uppertail. 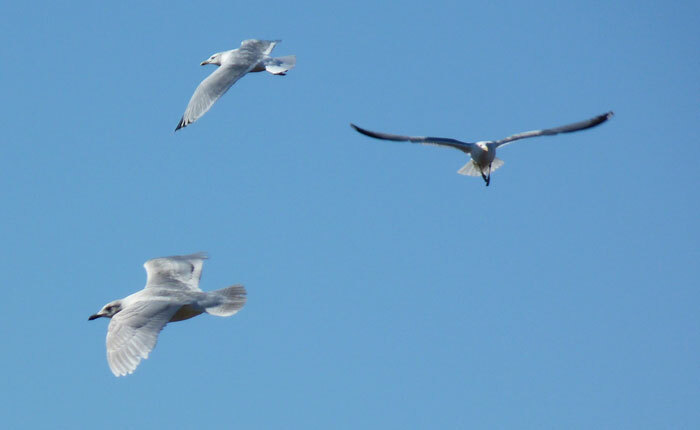 Also present, the continuing light second-cycle Kumlien's and the medium-dark first-cycle bird, along with the continuing first-cycle Lesser Black-backed Gull. 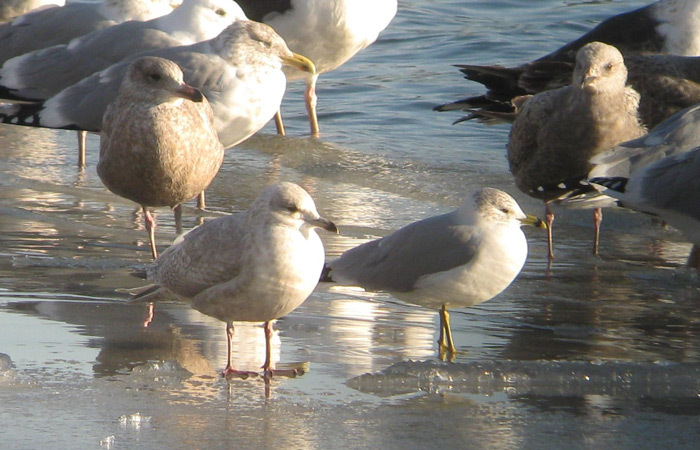 Kumlien's Gull (left) - first-cycle, present in the area for over one week to date. Barton Cove, Gill, Franklin Co., MA. February 13th, 2012. 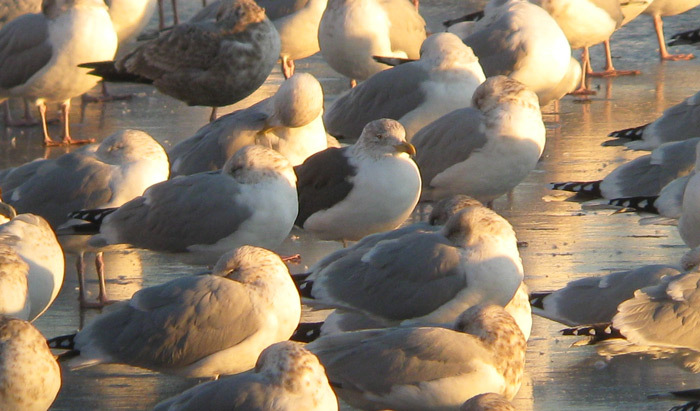 Kumlien's Gull (left of center) - second-cycle continuing, present in the area for over one week. Barton Cove, Gill, Franklin Co., MA. February 13th, 2012. 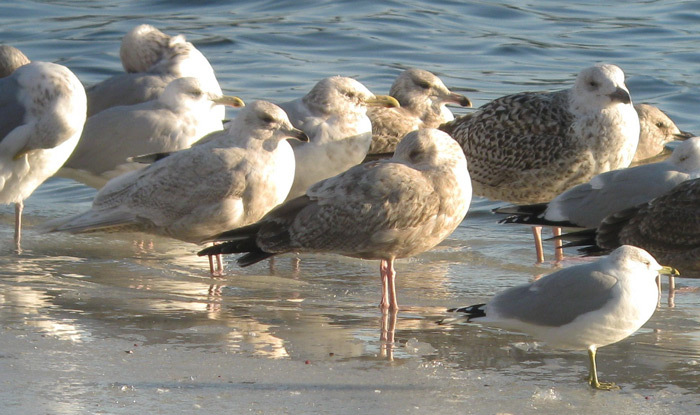 Kumlien's Gull - second-cycle with adult Ring-billed Gull, Barton Cove, Gill, Franklin Co., MA. February 13th, 2012. This individual appears to be new to the gull flock at Barton Cove and seemed absurdly small in direct comparison to Ring-billed and American Herring Gulls. 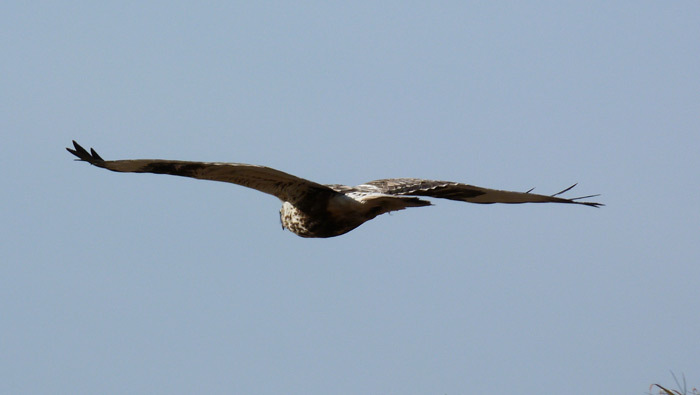 The same individual is shown in the shot above. Barton Cove, once again, was productive last Sunday (02/05). 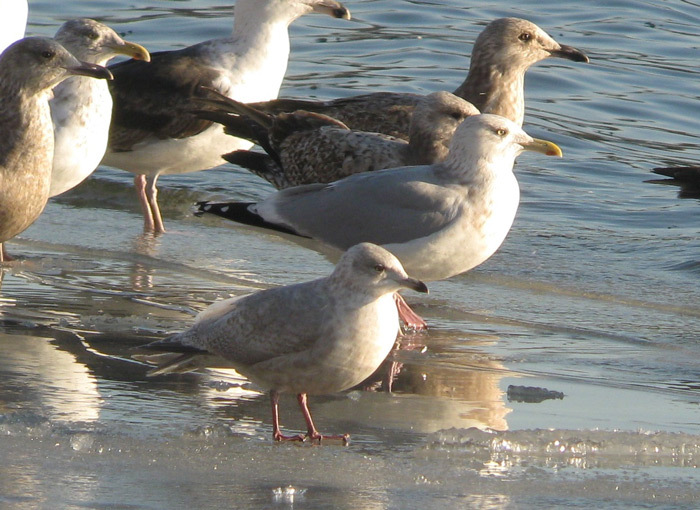 The small gull flock held five Kumlien's Gulls (all first and second cycle) and 3 Lesser Black Black-backed Gulls (two adults and one first-cycle), though no sign of the previous week's Glaucous. The Kumlien's included a nice range of plumages with one medium-dark bird, the type which often inspires thoughts of Thayer's, at least for a little while. 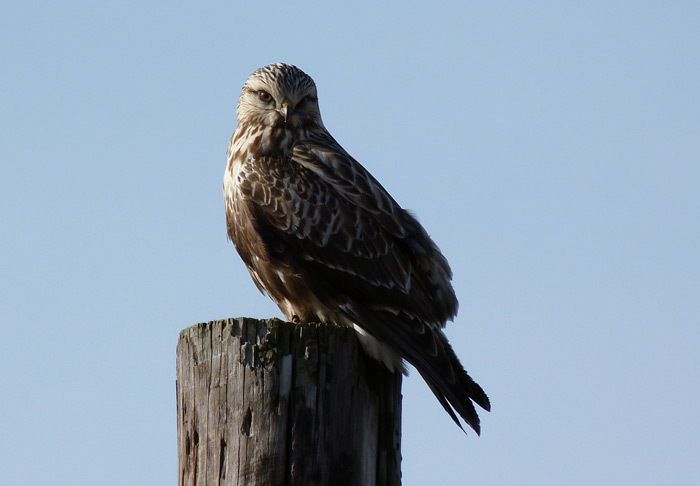 Rough-legged Hawk - Hadley, Hampshire Co., MA. February 8th, 2012. All pics taken with a Panasoni Lumix FZ40. 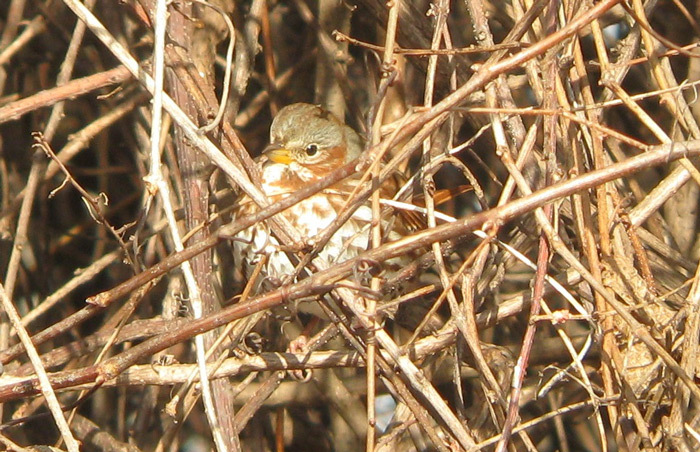 'Red' Fox Sparrow - Hadley, Hampshire Co., MA. February 8th, 2012. 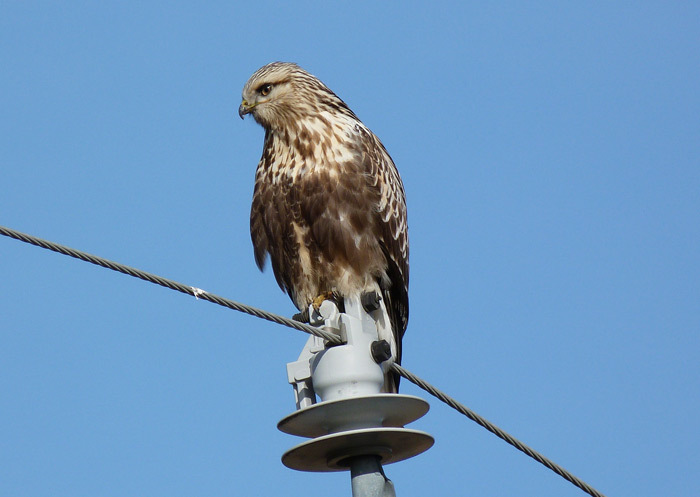 Susannah was in need of a ride down to UMassAmherst this morning which was all I needed for another excuse to go and look at the Hadley Rough-legged Hawk. 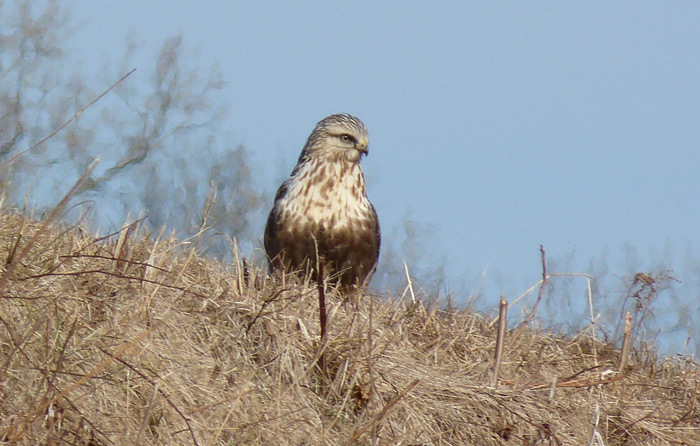 I found the bird straight away sitting on the grass berm between the fields and actively hunting down into the ditch below. It seemed to be in good shape, no signs of distress and I later saw it 'kiting' and sparring with American Crows by the river. It remains absurdly tame, sometimes getting dangerously close to the traffic on North Cross Road. Since it was yet another lovely (spring-like) morning, I decided to take my chances on another local scarcity, a Clay-colored Sparrow found over a week ago by Ian Davies. Despite being reported multiple times since Ian's find, I had no luck with the Clay-colored but did have a nice 'Red' Fox Sparrow in exactly the same spot that Scott Surner and I saw one on the Northampton Christmas bird count back in mid-December - the same bird perhaps? This morning was especially sweet as the Fox Sparrow burst into song several times whilst I was there. Other than that, just lots and lots of American Tree Sparrows, and an American Kestrel with prey on the drive out. 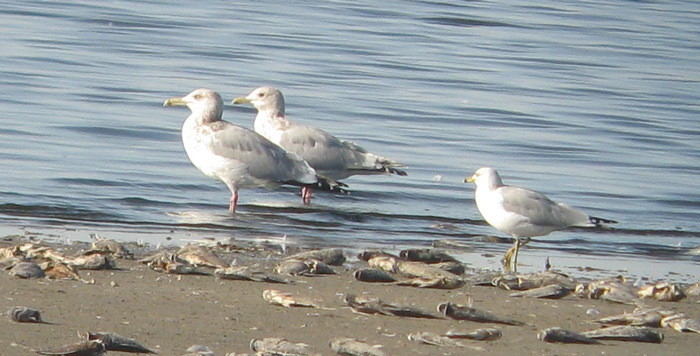 Just reflecting once again on our excellent recent trip to Arizona and California, and the Salton Sea gulls. 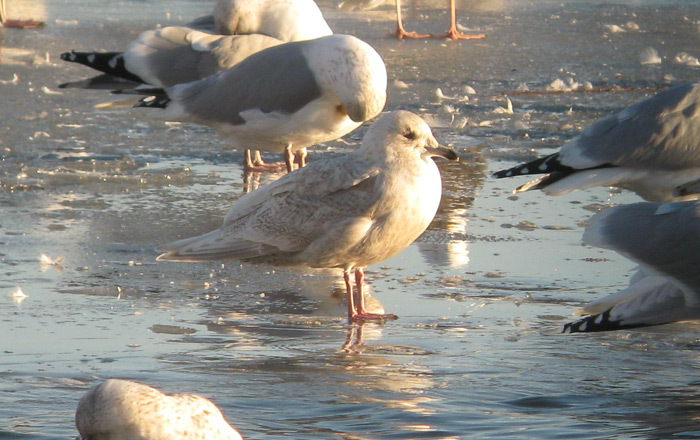 Of the twenty or so Thayer's Gulls seen on January 15th and 18th combined, I only detected one adult. 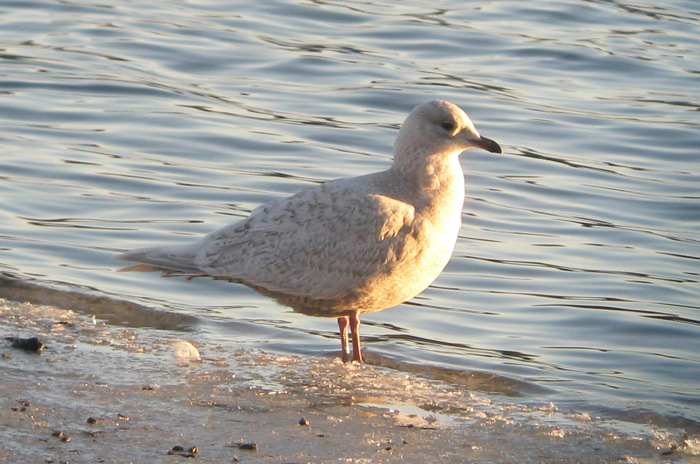 This bird, at Red Hill Marina, was conveniently resting next to an adult American Herring Gull and an adult Ring-billed Gull providing an ideal profile comparison, and a good opportunity to compare upperparts tone. 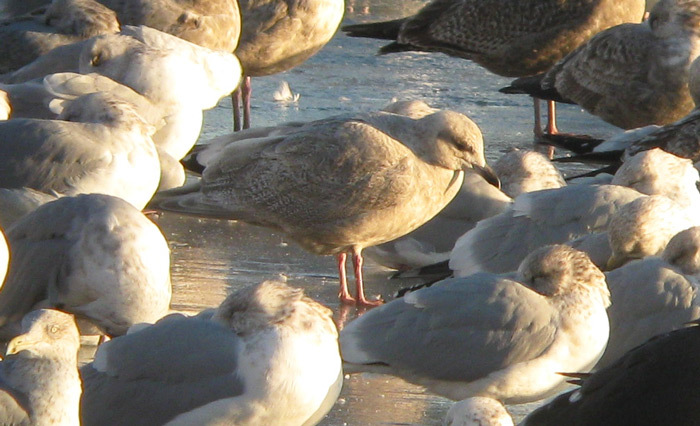 Curiously, the mantle shade of the adult Thayer's looked like a close match to the adult American Herring Gull, though I was of the distinct impression that it should (usually) appear darker (ref: Malling Olsen & Larsson and Howell & Dunn). Obviously, not the greatest of images but I couldn't detect any obvious difference in mantle shade in the field, or from the images. 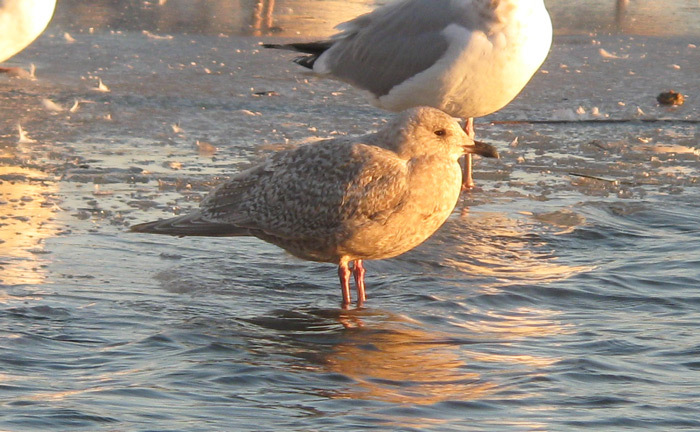 Though only one bird, this impression seems to be in keeping with a discussion on Thayer's Gull mantle shade on the ID Frontiers Listserve. 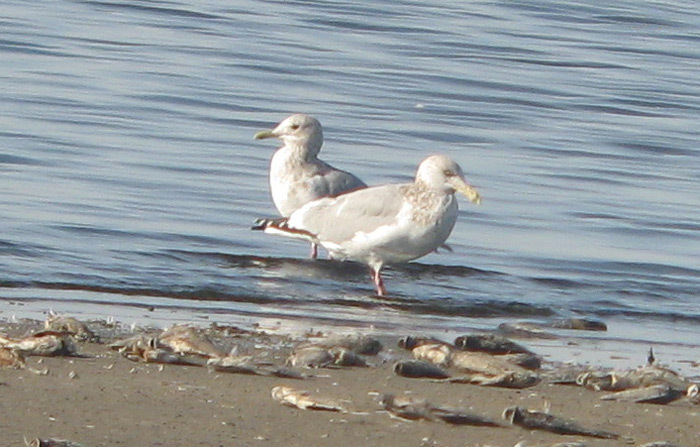 In essence, mantle shade appears to be of very little value as a field identification feature when trying to detect Thayer's amongst American Herrings Gulls, only adding more venom to the challenge of finding an adult Thayer's here in the East! 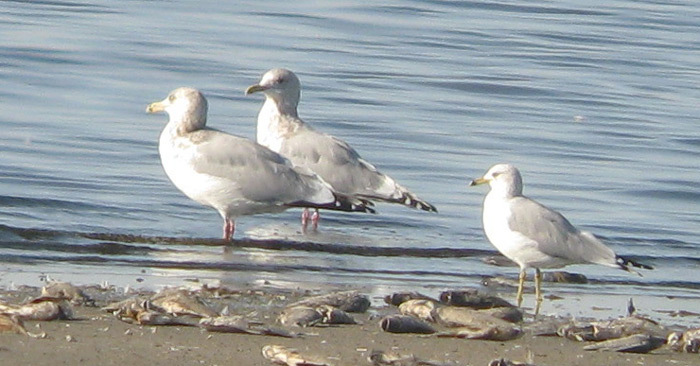 Thayer's Gull - adult (center bird in all three images) with American Herring and Ring-billed Gulls, Red Hill Marina, Southern Salton Sea, Imperial County, CA. January 18th, 2012. Kumlien's (Iceland) Gull - nice first-cycle bird found during a brief visit to Windsor Landfill, Hartford Co., CT. February 3rd, 2012. The need for a leg stretch and a bike ride took Matan and I down to the Turner's Falls power canal in late afternoon. Susannah had arranged to meet us there along with our friends from Keene, Pat Clark and Kerry Doyle. The timing seemed especially sweet since a local birder informed us of a Eurasian Wigeon which had flown into the canal early in the afternoon. This was almost certainly the same Eurasian Wigeon found by Taj Schottland in mid-January, a bird which didn't stick around long enough for me to see after returning from California. This particular bird didn't take long to locate and was especially vocal, its high-pitched whistled "wheeooo " call ringing out across the canal with Kerry Doyle very capably picking out the bird with binoculars while I wrestled with my scope. Though much anticipated, this was the first time I'd seen a Eurasian Wigeon (ABA Code 2) on my adopted local patch and it remained, calling, until dusk. Also present, three Northern Pintail, a Green-winged Teal and a Kumlien's (Iceland) Gull. Despite the presence of a giant raft of Canada Geese (c.1500), I couldn't find anything unusual amongst them......again. 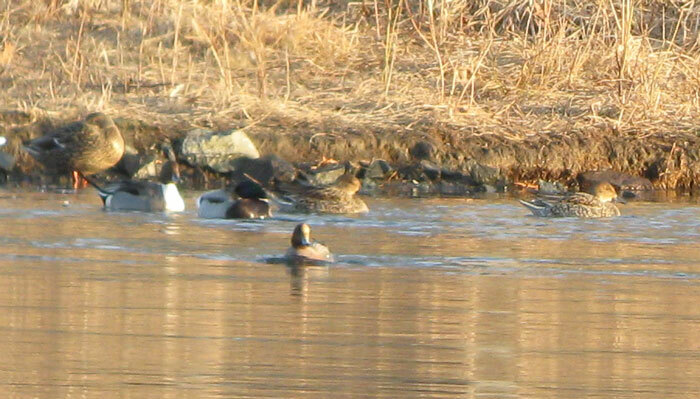 Eurasian Wigeon - male with Mallard (right), and three Northern Pintails (male left with two females). Turner's Falls power canal, Franklin Co., MA. February 4th, 2012. Eurasian Wigeon - male with three Northern Pintails (male left and two females right). Turner's Falls power canal, Franklin Co., MA. February 4th, 2012. 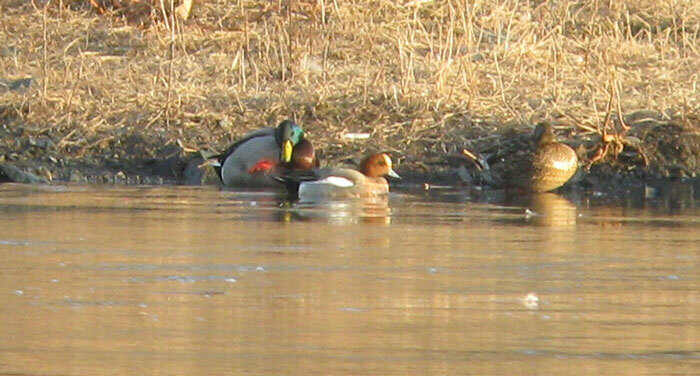 Eurasian Wigeon - male with Mallards, Turner's Falls power canal, Franklin Co., MA. February 4th, 2012. 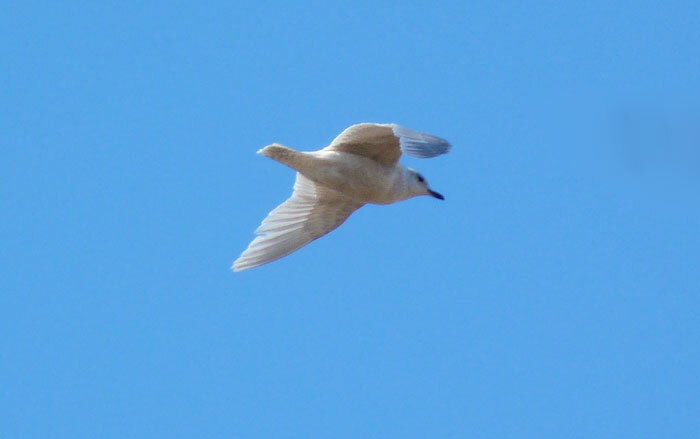 Kumlien's (Iceland) Gull - first-cycle with adult Great Black-backed Gulls, Turner's Falls power canal, Franklin Co., MA. February 4th, 2012. 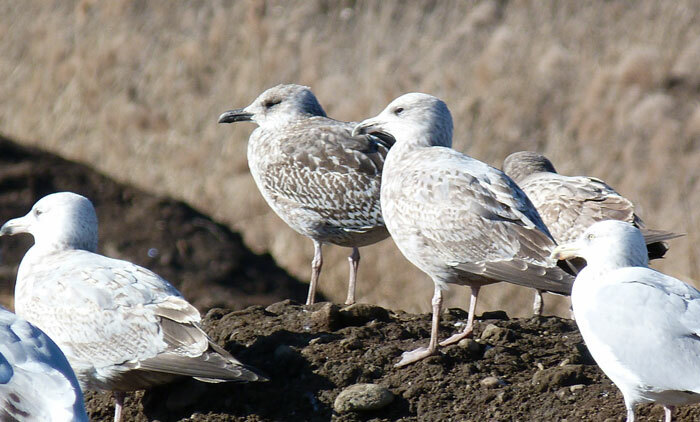 These birds later moved onto roost at Barton Cove where I saw a total of four Kumlien's Gull during a very brief visit. 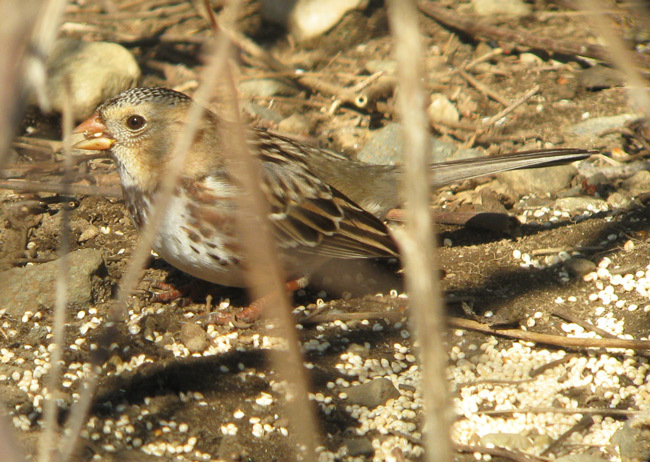 On the way home from seeing the Harris's Sparrow in Lebanon I spent about an hour at Windsor Landfill. As usual, quite good numbers of gulls (c.1000) but overwhelmingly American Herring Gulls and, surprisingly, only a few immature birds. The majority seemed to be adults. After as slow start I eventually picked out a first-cycle Kumlien's Gull, and this first-cycle Lesser Black-backed Gull. Leser Black-backed Gull - first-cycle with American Herring Gulls, Windsor Landfill, Hartford Co., CT. February 3rd, 2012. 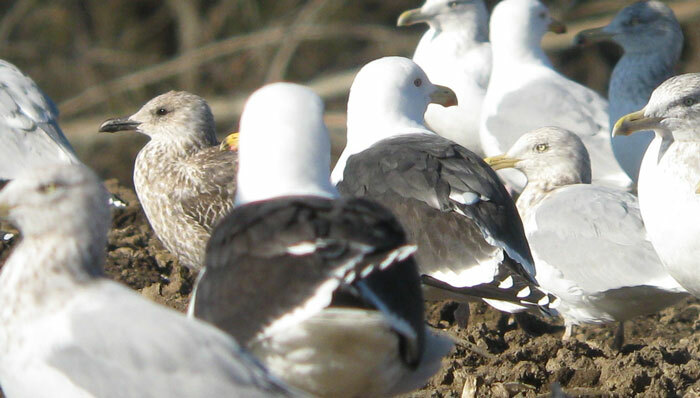 Lesser Black-backed Gull - first-cycle (left) with Great Black-backed and American Herring Gulls, Windsor Landfill, Hartford Co., CT. February 3rd, 2012. 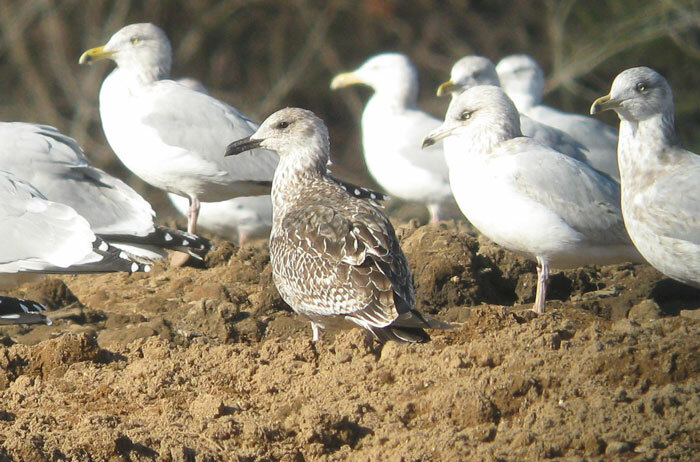 Lesser Black-backed Gull - first-cycle with American Herring Gulls, Windsor Landfill, Hartford Co., CT. February 3rd, 2012. 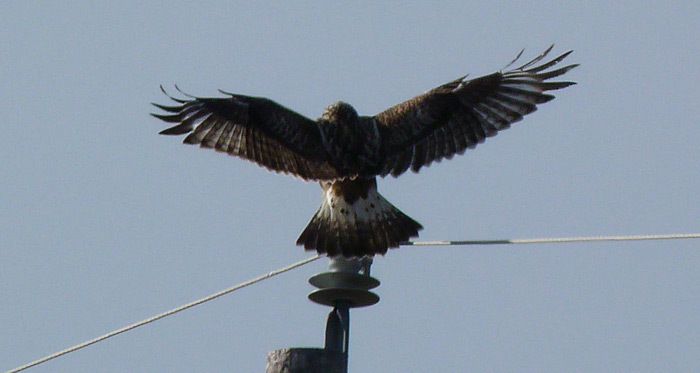 Nice view showing the whitish ground color to the underparts and uppertail with fairly sparse barring and a relatively narrow tail band. 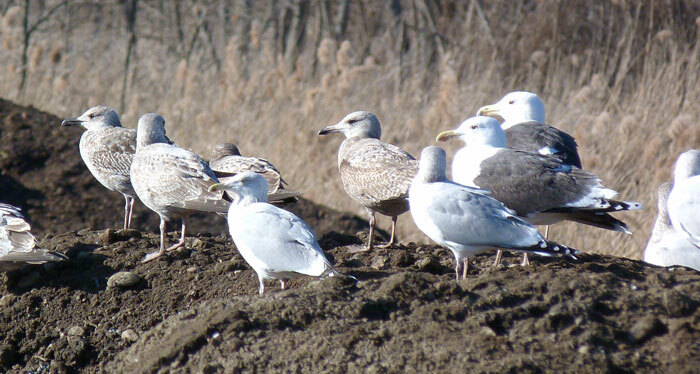 Lesser Black-backed Gull - first-cycle (center) with American Herring Gulls, Windsor Landfill, Hartford Co., CT. February 3rd, 2012. Didn't appear particularly small in direct comparison to American Herring Gulls but still showing neat, slender, all black bill. 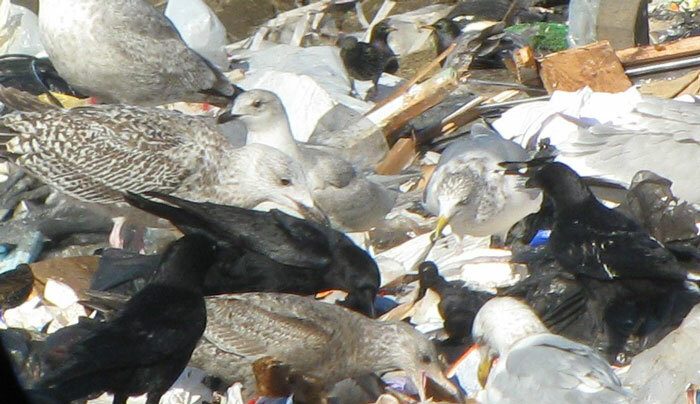 Lesser Black-backed Gull - first-cycle (left) with Great Black-backed and American Herring Gulls, Windsor Landfill, Hartford Co., CT. February 3rd, 2012. Easily lost in the crowd. Yesterday morning I finally found a nice window of time to travel the 100 miles SE needed to see a Harris's Sparrow in Connecticut. 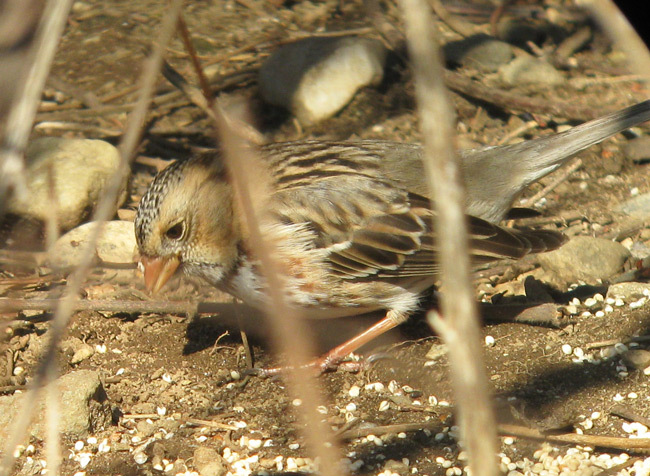 Originally found by Annie and Mike Perko whilst I was in Arizona in early January, this long staying bird was coming into a seeded area with other sparrows more or less at the spot where it was originally found. I was extremely grateful to receive excellent directions, and tips on the behavior of the bird before I'd even got there! 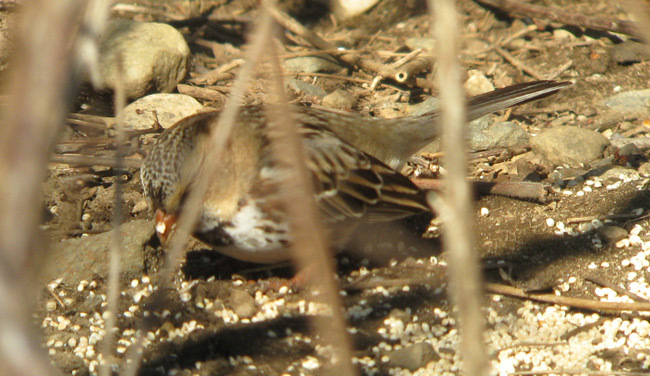 The Harris's Sparrow appeared about four times over a one hour period in late morning, consistently feeding with White-throated, Song and American Tree Sparrows. It seemed skittish and remained hidden for extended periods, and in the end I settled for a few, partially obscured digi-scope shots. 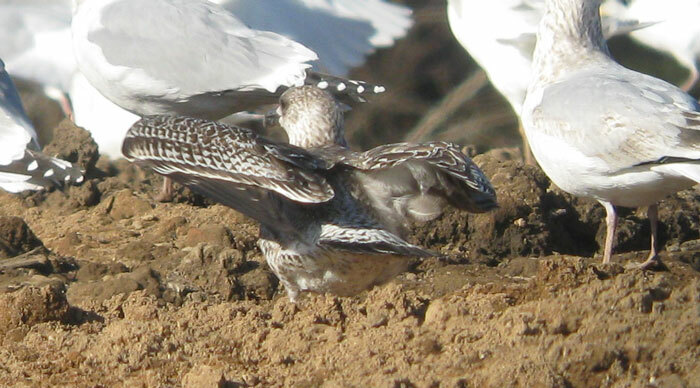 The bird's bill color was interesting with the upper mandible appearing distinctly orange-red in some of the images. Two other birds surprised me here, a fly-over Killdeer and a Red-shouldered Hawk, neither of which I'd expect to see back home at this time of year. 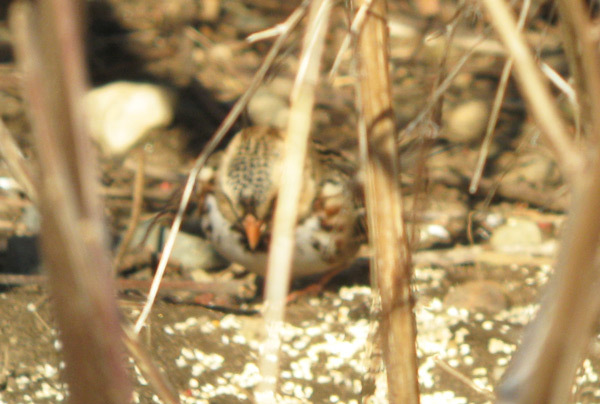 Harris's Sparrow - first-winter, Norwich Ave, Lebanon, New London, CT. February 3rd, 2012.